Big Pharma uses ads that sow hypochondria, raise health fears and sell diseases to adults and their children. It's no secret that advertising works. Big Pharma wouldn't spend over $4 billion a year on direct-to-consumer advertising if it didn't mean massive profits. What is more unknown is why drug ads that sow hypochondria, raise health fears and "sell" diseases are often the most common--and effective--even when the drugs themselves are of questionable safety. The nation's fourth most frequent drug ads in 2009 for were Cymbalta, making Eli Lilly $3.1 billion in one year, despite the antidepressant's links to liver problems and suicide. Pfizer spent $157 million advertising Lyrica for fibromyalgia in 2009, despite the seizure pill's links to life-threatening allergic reactions. The same year, it spent $107 million advertising the antidepressant Pristiq, even though it also had links to liver problems. So, how does Pharma dupe us into using unsafe drugs? Today's drug ads, targeted directly to consumers since 1999, seem like they sell diseases and often cast women, children, the elderly and mentally ill in a bad light. But a quick look at ads before direct-to-consumer advertising (DTC) in medical journals shows that drug ads have always done so. It's just that patients didn't used to see them. When psychiatric drugs first became popular for use in the general population, in the late 1960s, everyday personality problems became imbued with psychiatric labels. "Lady, your anxiety is showing (over a coexisting depression)," says a 1970 ad, showing an older, wrinkly woman in a bouffant wig with gigantic sunglasses and garish jewelry. "On the visible level, this middle-aged patient dresses to look too young, exhibits a tense, continuous smile and may have bitten nails or overplucked eyebrows," says the ad copy. "What doesn't show as clearly is the coexisting depression." The ad, both sexist and ageist, suggests the woman needs the antidepressant and tranquillizer Triavil. Another ad from 1968 shows a bored, upper-middle-class couple whose hauteur is also said to really be depression. "Do you have patients who try to hide frustration behind conformity?" says the ad for the antidepressant Aventyl HCl. You'd think such demeaning ads would vanish with DTC advertising because people would be offended. But You're Sicker-Than-You-Think ads are alive and well since DTC advertising and even flowering. A three-page consumer ad in the late 2000s similarly conveys that everyday psychological traits could actually be dire mental problems that require medication. If you are "talking too fast," "spending out of control," "sleeping less," "flying off the handle" and "buying things you don't need," you could be suffering from bipolar disorder said the ads, which appeared in magazines like People. And here you thought it was the coffee. Accompanying photos of a woman screaming into a phone and contorting her face are so extreme they could come out of the movie Halloween Part II, if the woman were holding a knife. Psychiatric drugs are not just advertised for everyday personality problems. Pharma is pushing them for everyday pain conditions. Eli Lilly's original depression campaign for the antidepressant Cymbalta, "Depression Hurts," seems to anticipate its subsequent approval for pain conditions including back problems. Now ads tout Cymbalta as a "non-narcotic, once daily analgesic FDA approved for three indications across four different chronic pain conditions," as if it does not have severe controversial psychiatric risks including the suicide of volunteers who tested it. And seizure and epilepsy drugs, known for major allergic and psychiatric reactions, are also becoming pain franchises. "What's causing your chronic widespread muscle pain?" asks an ad for the seizure and epilepsy drug Lyrica. 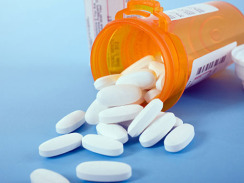 "The answer may be overactive nerves," says the ad, even though "widespread muscle pain" and "over-active nerves," are not mentioned in the approved labeling for Lyrica, says pharmaceutical reporter John Mack. The military spent $35 million on seizure and epilepsy drugs in 2009 alone, including for migraines, headaches and pain. And speaking of overkill, ads for genetically engineered injected drugs like Humira, approved to treat serious diseases like Crohn's disease, psoriatic arthritis and chronic plaque psoriasis look like they are designed to sell beer or beauty treatments, not immune suppressing drugs that invite cancers and lethal infections. DTC ads don't just escalate everyday problems into psychiatric problems, they also escalate real psychiatric problems into irresponsible, sensationalistic stereotypes. Ads for the best-selling antipsychotic Risperdal, widely used in children, and in soldiers with PTSD, suggest that people with mental illness have hallucinatory fears about "boiling rain" and "dog women." The "dog woman" ad, showing a half-dog, half-woman crouched on her elbows, her eyes blackened, furthers the sensationalizing of mental illness with the tagline, "Because relapses are a living nightmare." DTC ads don't just convince people they're in need of new drugs, but also that their kids may be, too. And it's been going on for decades. Yet neither Cylert--whose approval the FDA withdrew in 2005 because of liver failure and deaths--or the current ADHD drugs are safe. In 2009, researchers reported that kids are more likely to die sudden deaths while taking them and the American Heart Association recommends electrocardiograms (ECGs) before kids take them. And yet, combined sales of ADHD drugs continue to grow from $4.05 billion to $7.42 billion in 2010. Thirty years ago, it certainly looked like kids were being overmedicated. They were given the antipsychotic Thorazine for their "hyperactivity," "hostility," sleep problems and even for vomiting. Picky eaters and kids who wet the bed were given tranquillizers. Kids with tics, stuttering and school phobia were given the tranquillizer Miltown. But today, ads promoting drugs for kids continue, and now they are aimed at parents. Sometimes, it's hard to tell the difference between ads for drugs or ads for sugary cereals! Pharma tells moms to give their kids the bubble gum-flavored ADHD med, LiquADD and the grape-flavored ADHD med, Methylin. The latter campaign, to parents, is "Give 'em the GRAPE!" DTC advertising has also convinced parents their kids suffer from GERD (gastroesophageal reflux disease) otherwise known as acid reflux disease, which was barely a disease in adults much less kids, before consumer advertising. "GERD Can Be a Big Problem for Little Kids," say award-winning ads for Prevacid, which won a "RX Club" Silver award in 2004. In Europe, kids are treated for another "adult disease" and given chewable Liptitor to lower their cholesterol. Some of Pharma's most aggressive advertising has been designed to convince parents their children's minor sniffles or wheezing are imminent asthma and require immediate and expensive drugs. To make the asthma drug Singulair (which also comes in a yummy chewable), the seventh most popular drug in 2010, Merck inked partnerships with the American Academy of Pediatrics and Scholastic, both of which parents consider neutral organizations and not Pharma mouthpieces. Merck also partnered with Olympic gold-medalist swimmer Peter Vanderkaay and NBA kid clubs to sell the asthma drug. "A kid who's got what your kid's got is out doing what your kid's not," says one Singulair ad campaign. "Find out how you can help your child breathe a little easier." If Singulair were not harmful, the huckstering would simply be a case of wasting money and overmedicating kids. But Singulair has been linked to both pediatric suicide and to emotional, behavioral and ADHD-like symptoms in kids, the latter likely inspiring parents to give their kids "the grape." Of course, another kid-targeted campaign is for the vaccine against the sexually transmitted Papillomavirus or HPV, immortalized by Gov. Rick Perry and Rep. Michele Bachmann in hot exchanges this fall. Many object to the sexualizing of 9-year-olds, to government lining Pharma's pockets by promoting the vaccine (including overseas) and to the risks of the vaccines themselves. But the ads for Gardasil and Cervarix are also offensive. Last spring, poster-sized ads for Gardasil on Chicago's commuter trains pretended to sell real estate in sought-after neighborhoods. A closer look revealed descriptions of women in those neighborhoods who thought they didn't need the HPV vaccine but did, positioning HPV not only as a general risk to the population, like flu, rather than an STD but as "hip." HPV vaccine ads got even cooler when GSK rolled out Cervarix extravaganza TV ads and its "armed against cervical cancer" campaign with an Angelina Jolie-like model displaying a skinny arm with a Cervarix tattoo. 3. Be Like Me, and Can Your Beer Do This? Prescription drugs may affect health, but they are still consumer products sold with the same marketing principles as toothpaste or beer. In fact, the wacky, "Can Your Beer Do This?" Miller Lite campaign of the 1990s, came back to life to sell the antidepressant Wellbutrin XR. In a glossy, color magazine ad, a young man rows his girlfriend on a scenic lake and lists the benefits of his Wellbutrin XR. "Can your medicine do all that?" he asks. What does it say about the success of DTC advertising that people are assumed to have an antidepressant? Experiential ads also sell prescription drugs like vintage ads for the "Kodak Moment," "Maalox Moment" and the old cigarette ads for the "L&M Moment" did. "Lunesta Sleep. Have You Tried it?" asks a 2007 ad in Parade magazine, elevating the experience to something akin to "designer sleep." And just as celebrities move other consumer products, they have been deployed to sell prescription drugs. TV personality Joan Lunden and former baseball star Mike Piazza stumped for the allergy pill Claritin, ice skater Dorothy Hamill and track star Bruce Jenner for the pain pill Vioxx, and Sen. Bob Dole for Viagra. NASCAR figure Bobby Labonte also endorsed the antidepressant Wellbutrin XL in 2004. Yes, his medicine could "do all that." But there has been a problem with celebrity drug endorsements, unlike product endorsements in which a celebrity like Tiger Woods or Martha Stewart could taint a product, a prescription drug can taint a celebrity! Did Dorothy Hamill know that Vioxx doubled the risk of heart attacks in users when she stumped for it? Did the model Lauren Hutton know that hormone replacement therapy causes a 26 percent higher incidence of breast cancer, a 29 percent increase in heart attacks, a 41 percent increase in strokes, and a doubling of the rate of blood clots when she shilled for it? Does actress Sally Field know that bone drugs like Boniva are linked to esophageal cancer, jaw bone death and the very fractures they are supposed to prevent as she pushes them? Of course, good product marketing includes public relations. When Pharma sells a disease with no mention of the drug it is really selling, it's called "unbranded" advertising. Since DTC advertising, Pharma has invaded public service announcements (PSAs) that TV and radio stations confer for free, pretending their take-a-drug messages serve the public good, like messages to change smoke detector batteries or put kids in car seats. One such "educational" "awareness" campaign called "Depression Is Real" saturated the radio air waves in 2011, funded by the National Alliance on Mental Illness, which was investigated by Congress for its Pharma funding from Wyeth, part of Pfizer, and other groups. The high-budget ads, running for free, compare depression to diabetes because it doesn't go away and to cancer because it can be fatal. Animal research at drug companies and the National Institutes of Health is a great scientific iceberg of which people only see a tip. In drug development, millions of animals die to prove a drug's "safety." At academic and medical centers, animal study grants from NIH provide millions to researchers and labs. As sentiment grows against animal experiments and the government's gigantic National Primate Research Centers (new rules will limit the use of chimpanzees), the research is downplayed and even hidden. But there was a time when Pharma actually flaunted animal research. "More than a decade of animal research on various animal species has suggested that Librium (chlordiazepozxide HCI) exerts its principal effects on certain key areas of the limbic system," says an ad from the 1970s, showing three monkeys crouching and dangling in cages as assorted experiments are conducted. An ad for the diet pill Pre-Sate is even worse. It says, "one of the most sophisticated comparative animal studies ever conducted demonstrates direct action on the satiety centers," and shows five photos of cats in experiments. One shows a life-size white cat looking at the camera with a chain around its neck and invasive instrumentation embedded in its skull. Today's consumers, it seems, wouldn't tolerate ads like these. (Or the experiments behind them.) Why do they tolerate derisive ads about "dog women" and ploys to market pharmaceuticals to kids as if it were candy? Martha Rosenberg frequently writes about the impact of the pharmaceutical, food and gun industries on public health. Her work has appeared in the Boston Globe, San Francisco Chronicle, Chicago Tribune and other outlets. Martha Rosenberg's first book, Born With a Junk Food Deficiency: How Flaks, Quacks, and Hacks Pimp the Public Health, will be published by Prometheus Books in April.